Forget arbitrary plot points and formulaic three-act structure. Learn to build plot from strong characters with profound needs and desires in this four-week workshop. Forget arbitrary plot points and formulaic three-act structure. 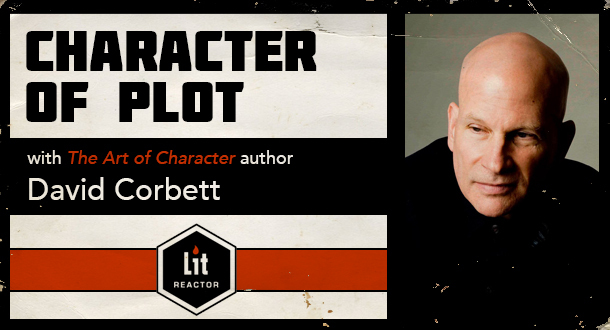 In this four-week course and workshop, acclaimed author David Corbett will guide you in the craft of building plot from strong characters with profound, mutually incompatible needs and desires. David has written acclaimed, award-winning books with incredibly rich characters and riveting plots, like The Devil's Redhead, Blood of Paradise, and The Mercy of the Night. He's an immensely-talented teacher, with the ability to deliver writing lessons in a clear, in-depth manner. He recently took his teaching to the next level with the release of The Art of Character: Creating Memorable Characters for Fiction, Film, and TV. This guide has already earned a ton of accolades—every one of them deserved. In this course, you'll learn how to orient the reader in the story world, with an exploration of setting as a revelation of character. Next you'll learn how to create the Crisis/Calling, by understanding the necessity to act on the part of the characters, and thus creating the opportunity or misfortune that kicks off the story. You'll then move on to the various ways to intensify tension, until the main characters are obliged to make the fundamental discovery that changes their understanding of themselves and their world, leading to the climactic transformation that concludes the story. Each week includes a lecture, a writing assignment, to be critiqued by David and your peers, as well as ample opportunity for discussion. Setting is the geography of character arc. Backstory is Behavior. And the seeds of the main characters’ internal, external, and interpersonal struggles exist from the very start. The opportunity or misfortune that compels the characters to act poses the fundamental story questions that will be continually addressed but never answered until the climax. It’s tension, not action, that keeps readers turning pages. Intensifying tension requires a constant amplification of the main characters’ ungratified desires. Characters succeed by failing: the challenge of continuing to try to fulfill the story’s core unmet desires force a moment of transformative insight that guides the climactic action. How to create the story’s arena, the physical locale that will provide the foundation for the values the characters seek to defend or maintain. How to use the arena to guide the overall story arc. How to conceive and establish the main characters’ internal, external, and interpersonal struggles that will form the story’s overriding action. How to explore the main characters’ backstories and how to reveal them in behavior, not narrative description. How to create a moment of misfortune or an opportunity that not only compels the characters to act, but speaks to their deepest yearnings and their internal and interpersonal struggles. How to sow the seeds of unmet desire that drives the action and creates tension. How to intensify that tension through a variety of techniques that increase the pain of losing what is desired, the pain of trying to acquire it, or its intrinsic value. How to enhance suspense through the creation of hope. How to create a series of escalating failures that guide the main characters toward a moment of discovery about themselves, their situation, or their relationships. How to use the discovery to forge the final gauntlet of climactic action, and create the transformation that provides a gratifying conclusion, and answers all key story questions. "David's LitReactor class allowed me to learn a huge amount from an incredible teacher. I went into the class with a book I was ready to give up on and came out with a book with fully rounded characters and a solid structure that I feel confident I can finish using the knowledge David gave me." —Larry G.
"David is extremely knowledgable, with an encyclopedic background in literature and film. He works hard on student critique and is committed to his class. Classmates were generous and supportive, led by David's approach to the online classroom. I've taken many writing classes through UCLAX and I found David's class to have been particularly eye opening and feel I've had a breakthrough by reading his lectures and paying close attention to his feedback." "David... really challenged us to expand our characters, to take them apart and analyze their lifes. He provided valuable tools. The lectures he provided will continue to help me develop strong characters. He provided very insightful feedback very quickly."